From the hands of visionary director Tadashi Suzuki comes a masterful, cross-cultural adaptation of Greek tragedy, The Bacchae, featuring an impressive cast of Indonesian, Japanese and Chinese actors. Written near the end of his life, The Bacchae has been hailed as one of Athenian playwright Euripides’ greatest dramas. Dionysus – the God of wine – unleashes his plot to punish Pentheus, King of Thebes, for denying Dionysus’s divinity. Madness ensues as Dionysus lures Pentheus to his death, torn to pieces by feverish worshippers, including his own mother, Agave. One of the most revered voices in theatre today, Suzuki is an eloquent interpreter of Greek tragedy for the contemporary stage. In a unique collaboration with art production house Purnati Indonesia, Suzuki continues to break new ground as he re-envisions this ancient conflict of madness and reason through an intriguing Pan-Asian lens. Dionysus will showcase costumes by Indonesian designer Auguste Soesastro and Suzuki himself, along with a musical score featuring Indonesian instruments composed by Takada Midori. 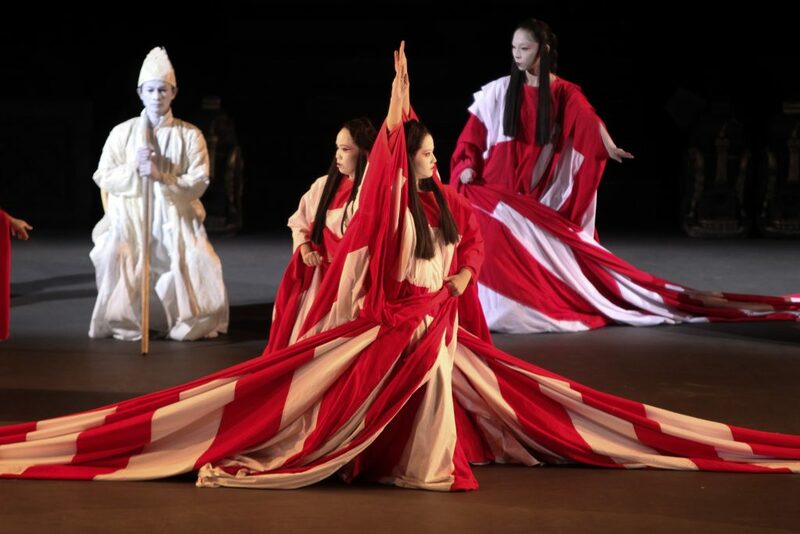 Following several years of intense training in Suzuki’s world-renowned acting method, Dionysus’ impressive cast of Indonesian, Japanese and Chinese actors is set to dominate the stage with their potent presence. Performed in Batak, Japanese, Javanese, Madurese, Manado, Mandarin, Rejang, Sundanese with English surtitles.